If you liked The Golden Compass and The Chronicles of Narnia, be prepared to fall in love with mythic fantasy all over again. The Jaguar and the Cacao Tree pulls you into a mesmerizing world that blurs the lines between science, mythology, and the hidden magic of nature most adults find all but impossible. 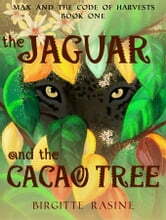 Includes 32 chapter illustrations and an appreciation by Dr. Allen Young, curator emeritus at the Milwaukee Public Museum and author of The Chocolate Tree. Language: English, with brief Spanish and Itzà Maya dialogue (all with English translations).